People always ask you where you were during significant world events. Where were you when Princess Diana died? Where were you during 9/11? I remember these things vividly. I remember being glued to the television, the feeling of disbelief as events unfolded before my eyes. My memories are through the filter of BBC News. I remember footage, complete with red ticker tape scrolling across the bottom. 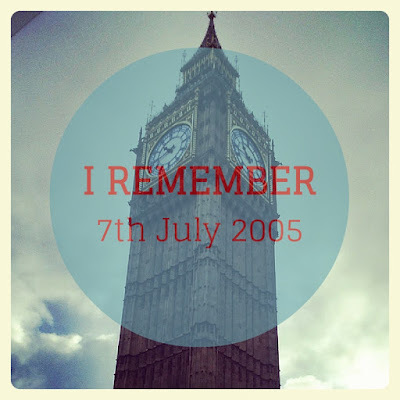 My memories of the 7th July 2005 are slightly more fractured. Because I wasn't watching events as a BBC News viewer, far away. I was a Londoner. I didn't watch events unfold on the TV, I was somehow, tenuously a part of it. I was 20 and working for my university on a residential summer school. We were looking after 15 and 16 year old kids from the local area of Islington. They were there to broaden their horizons. To be encouraged to look at University as an option. To be told that they could achieve anything they wanted to achieve, that they had potential, that the world was their oyster. Many were from disadvantaged backgrounds, many were from minority backgrounds, but all had the ability and potential to achieve to degree level. It was the beginning of the day and the children were gathered in a university classroom, I don't remember what for. The activities hadn't begun yet, so maybe it was some kind of briefing. We were going on a trip that afternoon - I forget where. We soon realised it wasn't of significance. Our supervisor came in and called the leaders into the corridor, her face had drained of colour. "There's been a series of explosions on the underground," she said "we don't know all the details yet but we need to keep the kids here for the time being, they cannot go outside, at least until we know what's happened. They think it was power surges." We were in a tiny classroom with about 20 children. I don't remember what we told them. They did have mobile phones, but this was before smart phones. They couldn't look up all the details on Twitter. Some attempted to call family members but all the networks were down, there was no phone signal, nobody was getting through. After an hour or so we were able to transfer the kids into the careers centre. We walked them down in groups. By this point we knew about Russell Square. We knew it wasn't power surges. Terrorism. Probably Islamic extremists. I don't know how the kids felt. Many were Muslim themselves. I don't ever remember making the connection. They were just kids. I don't remember any of the children making the connection. They had grown up together in school. Race and religion didn't come between them in their world. They were all just good friends. They were Londoners. At this point they were all allowed to use the phones in the office to attempt calls home. There were only a couple, and the phone lines were still down. It took a series of attempts. We just constantly listened to the silence as the lines failed to connect. The more the kids tried, the more they panicked. Their sisters, brothers, mums and dads used the underground for work. I remember a girl crying, saying "My mum uses the Piccadilly Line." There were very real possibilities that their family members were caught up in this, somehow. We allowed the children to try first and after a while I tried my parents - just to let them know I was safe. I remember not being sure whether they even knew. Did my mum watch the news during the day? Did they know what had unfolded? Were they even worried about me? Were we just overreacting? We walked our groups back to the halls of residence. Of all my memories, this is the most vivid. By this point it was probably around lunch time. It was about a 10 minute walk down a normally busy street. I remember there was no traffic. No movement on the roads. I remember business men in suits marching through the sunshine all headed south. Men just marching by foot, the only form of transport. Marching towards the Thames, probably headed to Charing Cross, Waterloo, London Bridge. Would they get home tonight? Were there trains? I don't know. I just remember each one in solitude, just marching in unison. How far some of them marched, I don't know. It was eerily quiet. It was silent. Everyone grim, solitary in their mission but united in their knowledge of what had occurred, and what that meant. It's not often the streets of London fall silent. Even in the dead of night, if you head down to the West End, you'll come across intoxicated revellers, club promoters canvassing on every corner, buses and taxis locked in heated jams and everywhere you look someone will be trying to sell you something. If the streets of London cease to emit sounds, lights, crowds and traffic, something, somewhere is terribly wrong. Something was terribly wrong. But do you know what else I remember? I remember people asking whether I would board the tube again and defiantly stating that it was highly unlikely that another bombing would take place the very next day, in fact, with such heightened security, London had probably never been safer! I'm not sure whether we were proven right or wrong a week later when police foiled a copycat attempt yards from my house at Oval. I remember marvelling at how life went on. At how in the days that followed London was not shaken. It could not be moved. How our best and strongest response was to continue as normal. How quickly the tube network was restored to full service. I remember in the weeks afterwards, feeling strange travelling through those stations on the tube, knowing that just weeks beforehand people had died there. I remember the sense of defiance. The sense of community. I remember how Londoners came together, every race, creed, religion and colour, to show unity in our grief. Grief for the lives lost and the lives left behind. But also grief for our great city, marred and tarnished by this tragic, senseless act which appeared to achieve nothing and yet ruined everything for 52 tragically heartbroken families. Beautiful post. An absolute horror to live through but definitely a show of the strength of spirit and defiance against giving in to fear from the people of London. I was in school when it happened and remember it filtering in on the news, I think we were told by teachers after lunchtime classes. A great memorial. 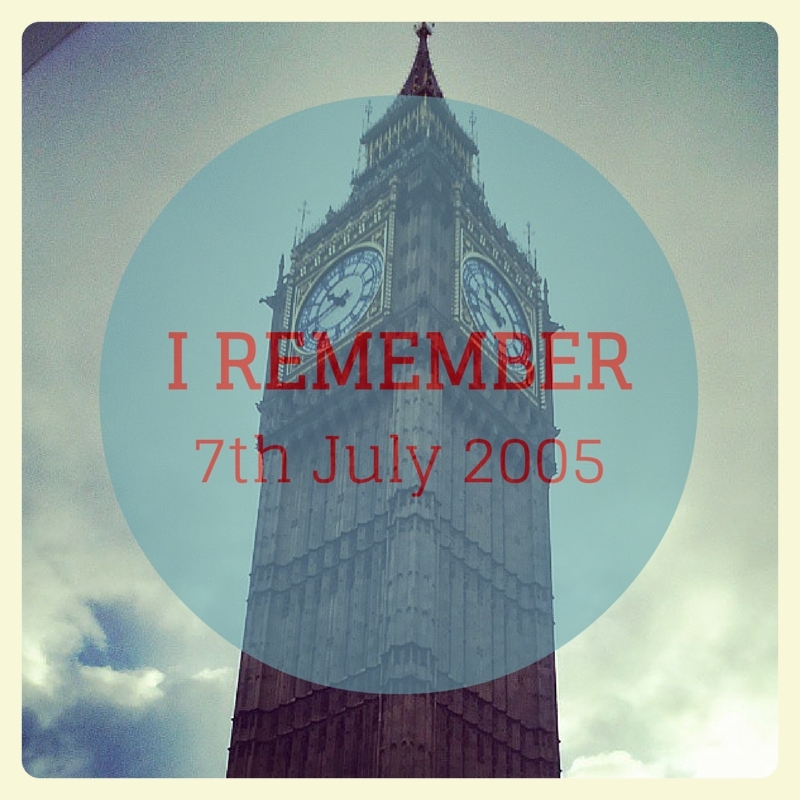 I remember too - I was working in the City and arriving at work as the chaos ensued. As usual I was on the phone chatting as I walked along but all we could hear were sirens. Everywhere. Realising something was going off - it just felt different to normal sirens of London life, more urgent somehow - the call ended and I hurried into work to hear of the suspected 'power surges' and the shocking news that unfurled. For that feeling of devastation to come after such a joyous day before - where we learnt we were awarded the London 2012 Olympics, and the whooping in the office that had brought - the difference was stark. I remember too how friendly London became, people were looking out for each other, bus drivers actually stopped to let you cross the roads and people were smiling at each other and sometimes even talking (I know unheard of!). And despite the devastation and lives lost, that spirit of London which emerged in the days/weeks that followed made me proud to be a Londoner.